Shortly before we started recording, she realised that she had left her suitcase in the cafe where we had met and had had to go off and get it, hence the laughter about half way through. She said that the crisis in Portugal is now one that you can really feel. The average salary is €840, the minimum wage is €480, and some OAPs are on a pension of just €150. This in a country where supermarket food prices are the same as in the UK. People are already starting to hungry. 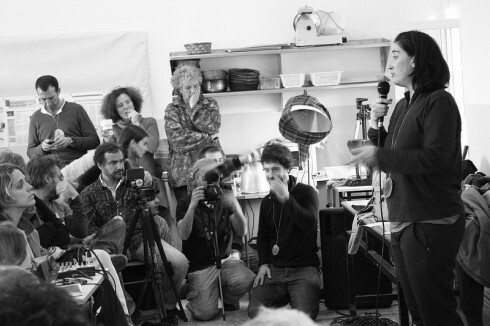 Filipa speaking at the recent Spanish Transition gathering. 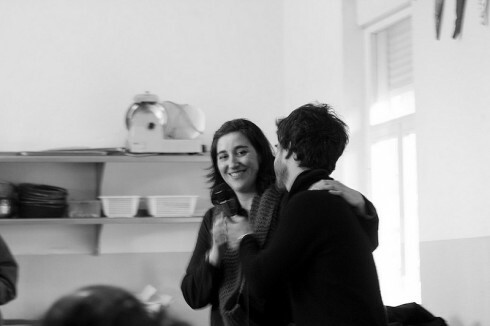 Transition is starting to spread in Portugal, but it has made a deliberate decision from the outset to base itself on the concept of the gift economy. In areas which are in financial distress you cannot, for example, charge for film screenings. The aim is to decouple money from the message of Transition, to, as Filipa puts it, “try to reduce money exchange in everything we do”. There are, she said, two reactions to a crisis. If you really believe that the crisis will go away, you hold on and you hold your activities and you wait. If you believe that it is here to stay, you start to adapt. What Transition initiatives have done in Portugal is to accept that it is here to stay. Initiatives in Portugal have been developing ways to organise low cost events, and to develop relationships with Councils not based on asking them for money, but asking them to share resources. I hope you enjoy this interview, in which she also tells a few of the most fascinating stories from the emergence of Transition in Portugal. Thanks for posting this informative interview. One of the points made by Filipa is that of working with municipalities—local government—less for obtaining grant funding and more to make use of facilities. Having only recently finished working with the City of Sydney I suggest that her idea is a good one. Where I worked we could make this happen and it was considered a grant not in money but in-kind. Only last week we did the second planting in the footpath food foragers’ garden there. The trick in gaining access to local government support is to present a case that demonstrates to municipalities that what you plan would enact the various city plans and strategies in some way, would benefit citizens and would show that the council is doing something positive. My name is Noah Sabich and I am writing you as a member of Eco-Ola, a Peruvian superfood group located near Iquitos, Peru at the headwaters of the Amazon River. We recently became apprised of your work through Permaculture Pathways and thought we would share our own permaculture story in case your readers might enjoy hearing of our aims and accomplishments. On our land at Eco Ola we grow numerous foods including a fare of the ancient Incans, Sachi Inchi, Camu Camu, Maca, an extraordinary Peruvian Cacao in addition to a number of other crops. Our farm is a scalable project, incorporating elements of organic permaculture and agro-ecology. For us, scalability means growth without compromise. As you know, the surrounding rainforest of our farm is among the most biodiverse habitats on the planet, so we feel a profound obligation to safeguard its natural wonders through gentle practices and balanced growth. We sincerely appreciate your time and consideration. You are an inspiration for our own work. Should you ever be interested in a collaboration, or if you are ever in Peru and would like to organize a visit to our permaculture farm for your fans, please do let us know.